Vishay Intertechnology released new series of Power Metal Strip shunt resistors available with two sense pins and offers low resistance down to 100 μΩ and power rating to just 36W which increase accuracy and lower costs. The newly launched WSBS8518…34 and WSBS8518…35 comes in a solid metal nickel-chrome alloy resistive element with a calibration notch and boot design on their terminals. This feature improves TCR performance (down to ± 10 ppm/°C) for better accuracy over extreme temperature condition. 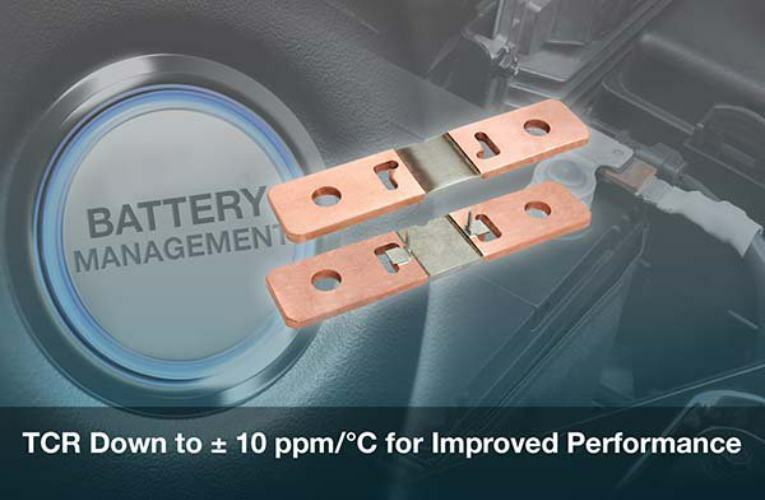 The shunt resistors offers unique design for battery management in gas, diesel, hybrid and electric cars and trucks as well as electric forklifts, large UPS systems, and other heavy industrial applications. The devices also offer NiCr Resistive element which gives the additional performance without compromising the design. With 8518 case size, the resistors offer processing technique that produces extremely low resistance values and allow for high current capabilities. The devices can operate in temeparature range between (-65) 0C to (+175)0C. Samples and production quantities of the WSBS8518...34 and WSBS8518...35 are available now, with a lead time of 10 to 12 weeks for larger orders.